Punching tool for turret punch presses, equipped with Thick Turret tooling system. Supply of standard, specialised, forming ( including tools from WILSON WHEEL) and alignment tools, adaptors for different sizes, inserts. The tool is available in the standard version and in the version with implemented AIR-BLOW tool lubrication system. With each punch the “Air Blow” special oil mist automatically lubricates the guide tool in the turret disc, the punch and the working edge of the tool. Tools with the Air Blow system proved to be 5 times or more durable than the standard tool. 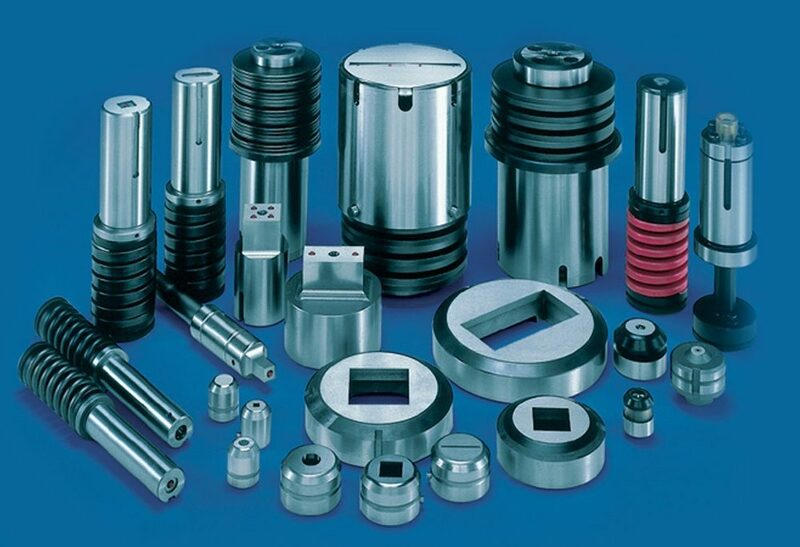 We also supply vacuum dies (used in Amada turret punch presses series AC, AE, EM, EMZ). Also available for order are guide tools and strippers for tooling of other manufacturers, which will allow you to easily resolve any technological tasks without having to purchase punches in assembly. Grinding tool for punches and dies of turret punch presses of all systems.